The role of a sous chef is always busy with a great deal of responsibility. They usually work in a commercial environment and have a great deal of variety in their day to day workload. A sous chef can be found working for any size employer but are often part of a kitchen team in hotels, restaurants and even cruise liners. They are employed for their passion for the delivery of meals in often stressful working environments and have to ensure the complete smooth running of a kitchen service. 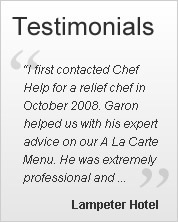 A sous chef reports to either an Executive Chef or Head Chef and is seen as second in command within a team. They need to be able to learn how the whole kitchen operates so they can step into the shoes of a more senior chef if more help is needed during a very busy period, or to provide instant cover during times of sickness or holiday. The job of being a sous chef also includes staff management responsibilities as they will be supervising many others in the kitchen as well as the mentoring and training of the more junior chefs. They will know how each job of the less senior members of the team dovetails into each other and then up to themselves as sous chef. This is because the career progression to becoming a sous starts as an entry level commis chef, then chef de partie and finally to the role of sous chef. A sous chef will either have graduated from a specialist cookery school, attended college to gain higher level diploma qualifications or will have entered the industry as an apprentice and worked their way up the career ladder. The main role of the sous chef is the planning and directing of the preparation of the food in the kitchen. There’s also the need to keep a watchful eye to identify any potential issues and be able to take control of any aspect of the kitchen within seconds. Quality control is also part of the job and the sous chef will want to see every meal before it goes to the table and may add their own finishing touches to each plate before the waiting staff take it to the customer. When not in the kitchen, the sous chef often takes on the role of arranging the staff rota and other associated administrative tasks. These can sometimes take up to as much as a quarter of the total weekly hours of the role. Being a sous chef is not for the faint hearted. It’s a job which is carried out at a fast pace in a hot and often noisy working environment, but for someone dedicated to the preparation of amazing food and has excellent leadership qualities, it is a dream job to be able to mentally and physically stretch their culinary expertise. If your team needs a sous chef who can keep the team motivated and get the food out to the customers both at speed and looking amazing, talk to Chefhelp today. We have a number of talented sous chefs who will be willing to work with you and your catering staff whether you have a permanent vacancy or need an urgent stand-in chef due to holiday or sickness issues.